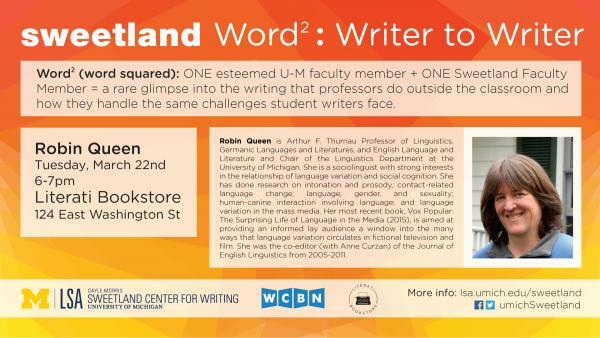 UM Sweetland Center for Writing's Word²: Writer to Writer series lets you hear directly from University of Michigan professors about their challenges, processes, and expectations as writers and also as readers of student writing. Word² pairs one esteemed University professor with Sweetland faculty member for a conversation about writing. This session features a conversation with Robin Queen. Robin Queen is Arthur F. Thurnau Professor of Linguistics, Germanic Languages and Literatures, and English Language and Literature and Chair of the Linguistics Department at the University of Michigan. She is a sociolinguist with strong interests in the relationship of language variation and social cognition. She has done research on intonation and prosody; contact-related language change; language, gender, and sexuality; human-canine interaction involving language; and language variation in the mass media. Her most recent book, Vox Popular: The Surprising Life of Language in the Media (2015), is aimed at providing an informed lay audience a window into the many ways that language variation circulates in fictional television and film. She was the co-editor (with Anne Curzan) of the Journal of English Linguistics from 2005-2011. This event is also broadcast live over the airwaves by WCBN (88.3FM or wcbn.org). This information was taken directly from the Sweetland Center for Writing's event posting.